Thank you to Soap Queen commenter, Charity, for pointing out that Martha is doing cupcakes this week! Hooray for Martha. Boo Hiss for the caloric overkill I feel coming on. Martha is also doing a Cutest Cupcake Contest and so far, there’s over 350 entries, including this adorable Pirate Treasure cupcakes by by Martha Stewart Online Weddings Editor, Erin Wylie. Think you have a cute cupcake to upload? Hurry! 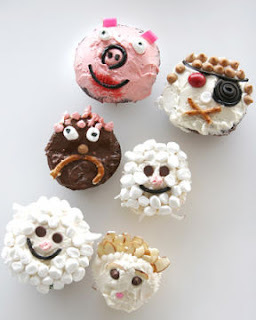 You have until April 4th to enter for the Cutest Cupcake Contest. Previous Post: But will it turn my lips blue? Anne Marie – don’t know if you know, but the owner of Seattle’s own Trophy Cupcakes is on Martha’s show tomorrow. I know you weren’t fond of the cupcake you got from there (I still need to get there! )I thought it was cool that Seattle was representin’ on Martha! Good for you, Heather! We’re all rooting for ya! A girl can dream… right? thanks for the love! I’m feeling it! 🙂 If they do catch any attention, we all have to go see Martha together, ‘k? What a great idea for chasing away the late winter blahs! I’m feeling inspired. What a great project to work on with the kids = ) Thanks for the heads up! Oh, I am SO not worthy of competing in anything that has an entry by a Martha Stewart staff member. LOL! But it reminds me that I’ve not read my last 2 issues of Living yet – they’re buried in my pile of about 20+ magazines that I’ve not gotten around to. I honestly don’t know how you get so much done, Anne-Marie!